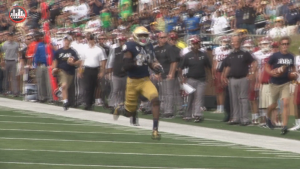 Notre Dame opened the 17-18 football season strong against the Temple Owls. City360tv host Johnny Romano catches up with former players Matthias Farley, Romeo Okwara and Jarron Jones. Also, post game comments from Coach Brian Kelly, players Josh Adam, Brandon Wimbush and Greer Martini and this weeks, Hit of the Week.